I haven't had a birthday cake since I was seven years old. Frankly, I've never wanted one. My candles were always destined for something greater than a crumbly funfetti, a pretentious Belgian chocolate… and please, don't even try to force a Fudgie the Whale on my celebration, like a suburban mom who just got her nails done next to Carvel. My birthday wishes were always lit atop a 3-pound semicircle of two-toned sherbet, gratuitous placements of chocolate chips, and pure, unadulterated summertime bliss. Friendly's Wattamelon Roll is my cake. It's my summer, waiting for me impatiently starting in mid-May inside the frozen food aisle. It's as if you placed the ripest watermelon in the world into an enchanted machine that turns every food into an ice-creamed analogue. And it actually came out better. The "meat" of the melon is a flamingo-colored watermelon sherbet flecked with semi-sweet "seeds" made of chocolate chips. The rind is a smooth outer layer of tart lemon sherbet, dusted with a sour lime powder to assume the outer green skin. And when you manage to get all three flavors in one bite, it's a flavor combination as refreshingly sweet as Little Miss Sunshine, with way more calories, and only a fraction of the existential loathing you feel after watching Little Miss Sunshine. This is a dessert that actually makes you feel good during and after. It's light. It's citrus-y. And it's available only during the brief, sticky window of summer. Yes, the name is stupid. Yes, it's more of a rapidly melting block of sherbet than an actual cake. And yes, it's often harder to find than a parking spot at Six Flags in mid-July. But for those with access to a Friendly's -- or more importantly, for those who happen to live in the Northeast, where the summers are sweltering, the beaches are packed with tourists and locals alike, and you can actually buy one of these in some select supermarkets -- you might be privy to the fact that this Wattamelon Roll is the ultimate dessert of the summer, being the superior frozen version of the original snack of the summer, which is also known as Nature's Candy. This is the actual candy version of nature's candy. It's hard to deny its unnaturally natural draw -- like it embraces the uncanny valley, and makes a dessert of of it. And for the most part, my feelings were vindicated earlier this week, when New England Patriots Head Coach, football genius, and anthropomorphic dish towel Bill Belichick actually referenced the Wattamelon Roll (along with "badminton contests") as he rattled off the frivolities of summer that NFL training camps certainly do not employ en route to excellence. Apparently, pressure makes diamonds, but Wattamelon Rolls and badminton forge losers. 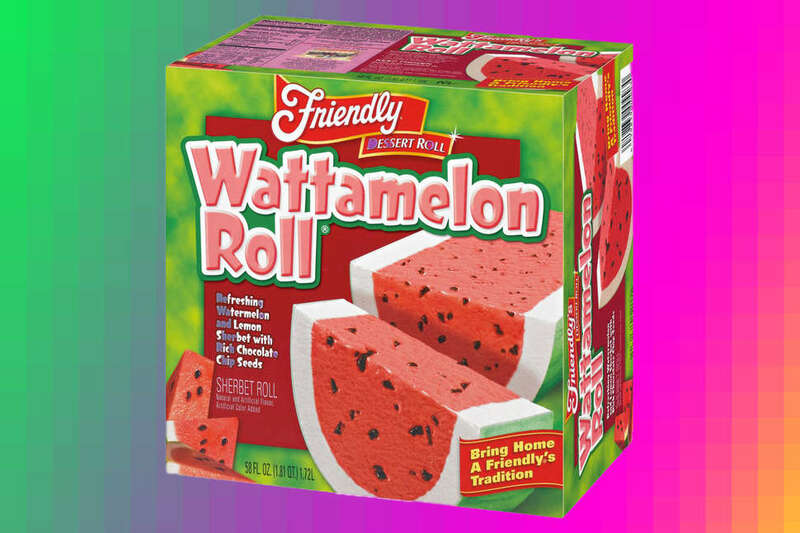 Listen: This is a serious endorsement for the humble Wattamelon Roll. If BB fears your very presence during his training camp, you've already won the war of intimidation. And it's also important, because most American citizens have trouble believing this miracle of modern culinary design even exists -- let alone in the form of something even remotely appetizing. Belichick makes an important distinction here along with his seemingly knowing nod of appreciation. Wattamelon Rolls are an essential facet of the nothingness of summer. It's an entirely frivolous dessert. It's hard to eat. It makes a mess. It's a fake fruit, for God's sake. But -- for me at least -- it reminds me of catching lightning bugs in the yard, or hitting my brother in the cornea with a pool noodle. Or blowing out candles over a pile of sherbet and making 14 other sixth-graders take time-is-a-factor bites of this regional dessert that melts faster than a snowman in Dubai (but that's actually OK -- you basically end up with a bowl of chilly citrus gazpacho... just make sure you use a bowl and not a plate). Wattamelon Rolls and summertime are forever linked. I'll never be able to dig into that sherbet rind without being reminded of what it was like to grow up in those hot New Jersey summers. And I'll never flip the calendar to September without taking a bite of at least one slice of watermelon sherbet, peppered with chocolate seeds, and complete with a thin line of lemon sherbet to chase it all down and into my rapidly depleting beach bod. Sorry, Bill. But it beats the hell out of training camp -- or any badminton contest. And it will always be my birthday cake.